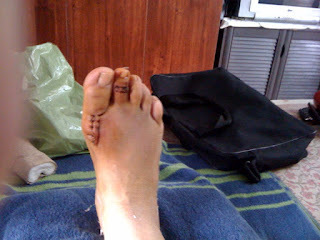 My feet and I have not been the best of friends, especially in recent years. As a young child I had to walk on tiptoe and on the sides of my feet to correct a tendency to flat feet. As a teenager my vanity took a beating as my feet relentlessly took on the shape of my father's feet- broad and knobbly, not at all like my mother's slender ones. I would often express my frustration to my poor father, who listened to me with his characteristic good humour, and then comforted me with the fact that they were servicable feet that allowed me to walk and run, and were therefore a blessing to be counted! Buying pretty footwear was Mission Almost Impossible. All sneakers would soon develop a hole where the bone protruded, and would hence look shabby way before they should have. I most certainly did not have Happy Feet. Anyway, I had the surgery in early September, resting at the older daughter's home, and having the dressing changed every second day.You can see the tip of the inserted pin at the top of the second toe in the second photo. The pin was removed shortly before I left for home. I was allowed to walk, and felt very proud of myself for every round of the colony compound! 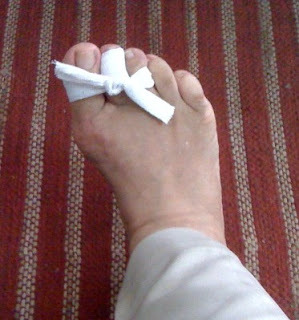 Although the stitches had healed well, and I was continuing to foment the foot in hot saline solution and having hot wax treatments, the toe remained elevated. 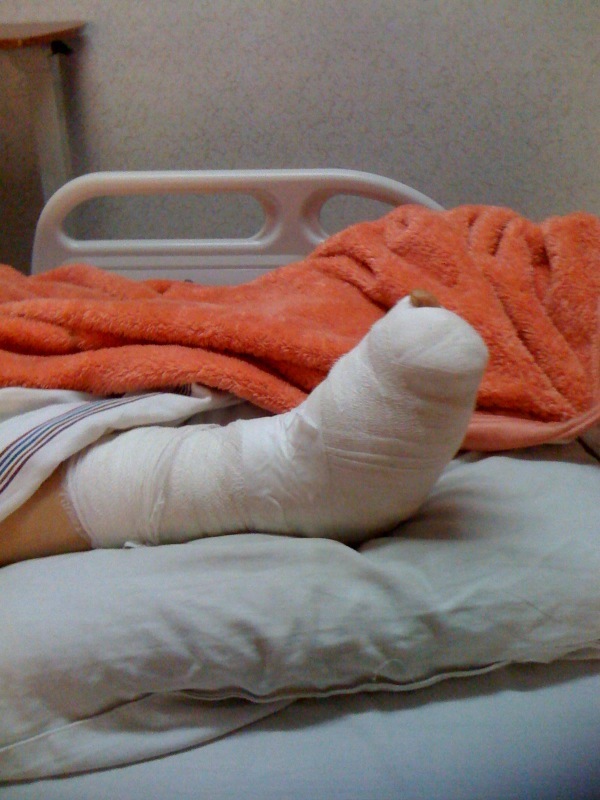 On the next visit to Delhi, two months after the operation, the doctor gave me heavy sedation and did something drastic to the toe, externally, to free the joint. That was really painful, as was my left arm, which was all swollen after the intravenous injection. (Strange, because I was also given an IV shot in my right hand, which remained normal)! As Footji is still a little swollen, I live in floaters- which I even wear with (gasps of horror) sarees. I hope that I am able to wear all my sandals and shoes eventually, even though my girls call most of them 'dhup-dhups', since they weren't particularly elegant or pretty to start with. Godji and Footji, I have got the message. I am grateful for the feet I have, promise. My dear feet, please, please behave and remain serviceable and walkable. 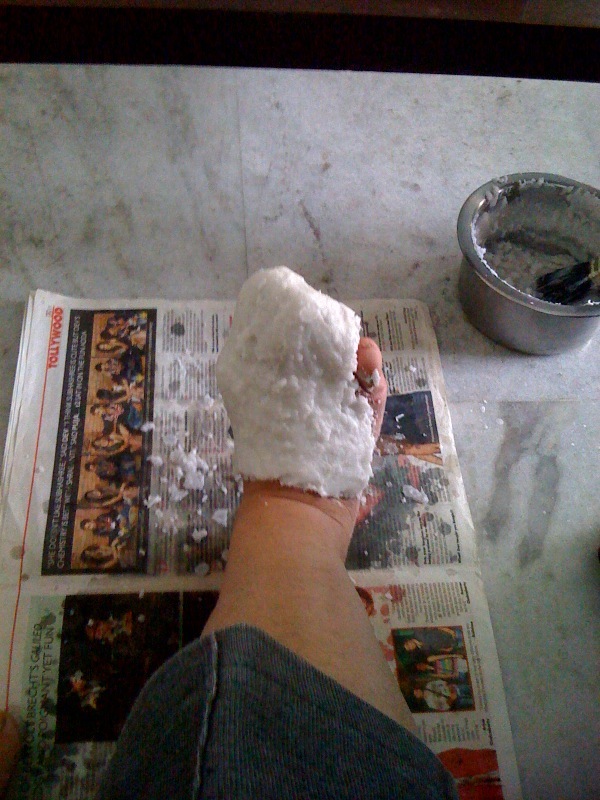 Edited to add: Since I'm posting such intimate details about Footji, here's another pic., of Footji having hot wax therapy! Here's hoping that Footji co-operates. Wishing you a footful 2013 eh? @Preeti: Thanks, Preeti:) My sense of humour is mighty pleased! @R's Mum: Only occasionally painful now. Thank you for your footful wishes:) May you have a great year too! Hope footji heals very soon Dipali..
Gosh! That sounds too painful. Take care and feel better. Love your spirit taking this in stride (no pun intended :) )! Sounds really awful...glad you are on the road to recovery! Wish you Happy Feet !!!! I have to say this, DipaliJi, you are very brave. I hope that you will be able to wear all those pretty sandals and shoes. Your post teaches us to thank the Almighty one for the blessings and the little sufferings we are blessed with in our life. I too pray that my dear feet will also 'please, please behave' and wish you the very best after the feet rest. Take care. Keep writing. @Sands: Thank you, and all puns, intentional or not, are welcome! @Sukanya: My daughter pampered me through the worst of it! @Sanand: Thank you so much!I hope to write much more this year.